1. Thankful that my dog's poo eating has decreased slightly. 2. I am thankful for my husband. Who has never eaten his own poo. That I know of. 3. I am thankful that I am employed. And that I actually really like my job. Very, very thankful. 4. I am thankful for fleece. Because of its many amazing qualities. 5. I am thankful for candycorn. Althrough I cannot be trusted with it and therefore limit myself to 1 day per year of candycorn consumption. That day has passed. I now have moved on and look back fondly and reverently. 6. I am thankful for Amie, my assistant at work. If there were work gold star charts, hers would be filled. 7. I am thankful for my mom who doesn't seem to mind my incessent calling. Or if she does, she does a damn good job of hiding it. 8. I am thankful for Costco. Because it is just such a darn fun store. And I love it when they sample the franks in a blanket. Because they are both deliscious and hilarious. Thank you Costco for providing many hours of entertainment. 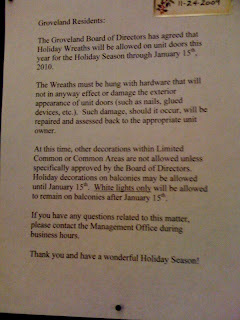 "The Groveland Board of Directors has agreed that Holiday Wreaths will be allowed on unit doors this Holiday season..."
It then goes on to explain that no other decorations on our decks or elsewhere are allowed. 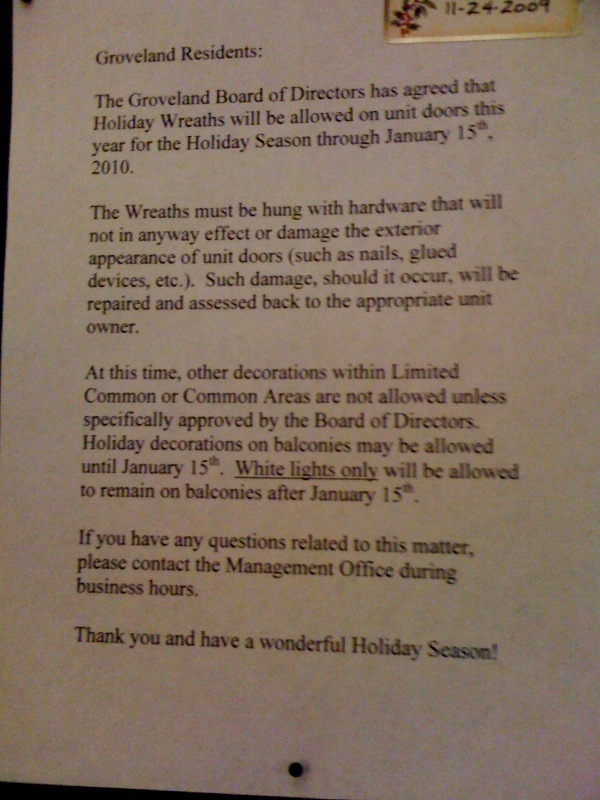 Jeremy and I will hide our menorah in our bathroom so nobody sees it through the window, thus breaking association rules. Thank you comunist Russia. Also known as the Groveland.